AISLE-Base™ is a seismically isolated platform system onto which your choice of server racks, cabinets, or equipment can be placed, in either a hot or cold aisle containment configuration. Since many existing raised access floors were not designed for the higher concentrated weight loads that an aisle containment system creates, the AISLE-Base System provides for the use of our exclusive ISO-Stands™ to support those higher weight loads. The supports allow the bottom frame of the isolation platform to be lowered into the raised access floor, reducing the overall height, providing improved accessibility, and sleek design. Depending on the seismicity of a site, and to meet local codes, an engineer can specify how the ISO-Stand supports are anchored to the concrete. Also, where higher than normal amounts of vertical acceleration or vibration are expected, ISO-Stands can be outfitted with seismic isolation feet to enhance all axis isolation, and reduce input accelerations. The AISLE-Base™ system utilizes new NextGen Ball-N- Cone™ Isolators that provide maximum displacement capacity in a compact 15” design. In addition, the isolators feature our exclusive QuakeCoat™ Elastomeric Damping Liner to ensure the isolator achieves its total displacement capacity, while reducing input accelerations. 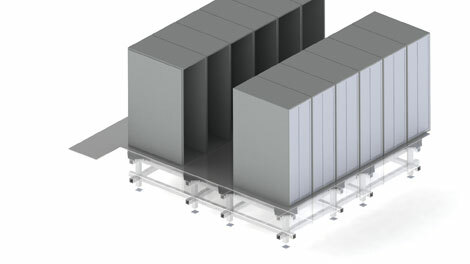 To complete our total system approach, we have integrated KoldLok® Air Management Products into the AISLE-Base design. The use of KoldLok® and other Upsite™ products help to ensure proper airflow management and energy cost savings.